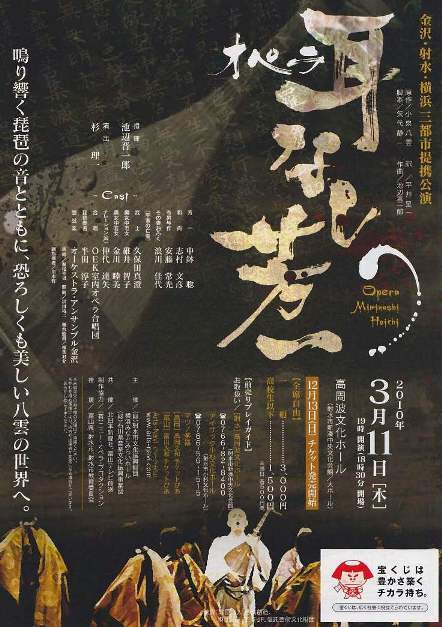 Last week, I got a chance to see the opera of 耳なし芳一 (Mimi Nashi Houichi). One of my first posts on this blog was a translation of the story, which originally appeared in print in Lafcadio Hearn’s collection of Japanese ghost stories Kwaidan 怪談. I’m not terribly familiar with Hearn’s works, but Lafcadio Hearn was, as I’ve learned, a half-Greek half-Irish journalist who lived in Cincinnati and New Orleans, later taking a position in Matsue, Shimane-ken. There, he married a Japanese woman. He took her last name, Koizumi 小泉, and a Japanese first name, Yakumo 八雲, and became a naturalized Japanese citizen. In Japan, the majority of population seems to know him by his Japanese name, whereas in the US, I almost always heard him referred to by his original name. In the playbill, he was referred to as ラフカディオ・ハーン with a note about his Japanese name. The Heike warrior bids Houichi to play the ghosts a tune. The opera’s interpretation of the story was pretty much exactly the same as the story, so there were several key points that I had wondered how they would replicate on stage. First, there was the introductory explanation of the Battle of Dannoura and the drowning of the Heike clan. This scene in the opera was brilliant–the actors playing the ghosts of the Heike were covered by a net and moved around underneath it under dim lights to simulate the writhing bodies of the drowning in the sea. They held small blue lanterns, which were used again when the temple-keeper and his wife discover Houichi in the graveyard surrounded by ghostly lights. The scene was spooky and the use of textures and lighting was great. The second key scene I had wondered about was the scene in which the priest paints sutras on to Houichi’s body. Because Houichi (Chuubachi) is supposed to be covered from head to toe in calligraphy, I was unsure how the actors could accomplish such a thing without taking hours to actually write the sutras on Chuubachi-san’s body. In the opera, the priest takes Houichi behind a screen as three temple acolytes chant the sutras. A sutra was projected onto the screen. About five minutes later, the actors emerged. What they had done was cover Houichi’s face and bald cap with what appeared to be sutras written on clear sticky film and dressed him in a robe with sutras written on directly on it to mimic the effect of his whole body (sans ears) being covered. I had initially envisioned a body suit with sutras written it to the effect of one of those yakuza tattoo shirts, but due to time, appearance, and/or modesty, they decided on the robe. 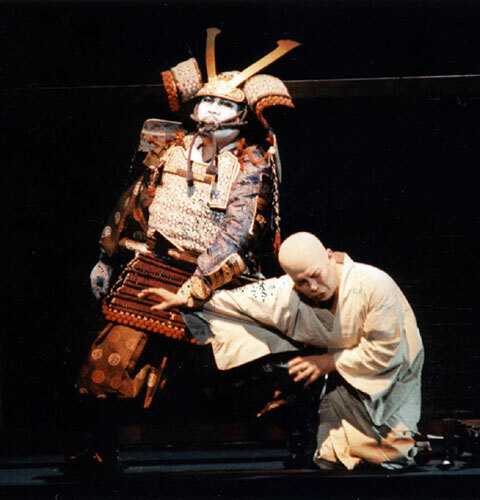 One other problem with adapting the story into an opera was the playing of the biwa. Houichi is supposed to be a very skillful biwa player, but the chances of finding an opera singer with high-caliber biwa skills was slim, as the playbill noted. The composer asked Handa Junko, a famous biwa player, to sit in the orchestra and play the biwa while Chuubachi mimed the motions. It was a little unsettling because he was just slightly off in his movements, but overall it was a good choice–particularly in the epilogue scene, in which Houichi had a hat to cover his missing ears. He played the biwa beautifully–and then the actor removed his hat. We saw the biwa player’s hair tumble down instead of the bald-capped Houichi we had been expecting, and Handa-san was met with thunderous applause. It’s really a shame that this opera only played in three cities for three nights this run, but it was well worth the drive to the city for the opportunity to see an opera in Japanese, set in Japan, and based on a Japanese folktale. Furthermore, I had never heard a biwa live before, and I was really struck with the sound of the instrument. If anyone has recommendations for biwa players, CDs, or events, I’d love to hear them! *For example, the late Pavarotti as a starving artist in La Boheme, or 30-somethings singing the roles of Romeo and Juliet in Romeo et Juliette. I’ve never seen any opera, least of all a traditional(?) Japanese story adapted for opera. It really sounds like quite the special opportunity and rare experience. I’ve never seen any opera, least of all a traditional (?) Japanese story adapted for opera… It sounds great; I especially like what they did with the biwa player at the very end. Sounds like quite the rare opportunity and special experience.